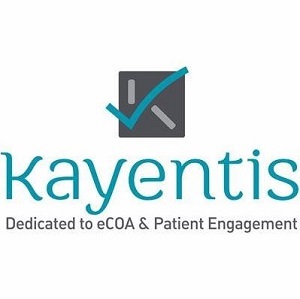 Kayentis is a global provider of electronic Clinical Outcome Assessment (eCOA) solutions for patient data collection in clinical trials. Created in 2003, Kayentis has specialized in eCOA solutions since 2009, developing a full range of services and extending its solutions portfolio to support pharmaceutical companies, biotechnology companies and CROs. Today, with experience of more than 150 clinical trials in 75+ countries (6,500 sites and 50,000 patients) and in a broad range of therapeutic areas, Kayentis adds value to data quality and clinical trial efficiency with innovative and intuitive solutions.